These cards have been all over the internet. I resisted the urge to make one but thought the ladies in my technique class would like to have a go. I ended up making a sample for class when Hannah (5 years) saw it and said I had to make one for her to give to her teacher for her birthday. I made mine a little more simple than most you will see on the internet. I prefer it that way. I didn’t embellish the sides (apart from some embossing using the petals-a-plenty embossing folder. I also used the Stampin’ Write Markers to add the different colours to this stamp set from Delightful Dozen. Isn’t her handwriting amazing. She wrote this the day before she turned 5. 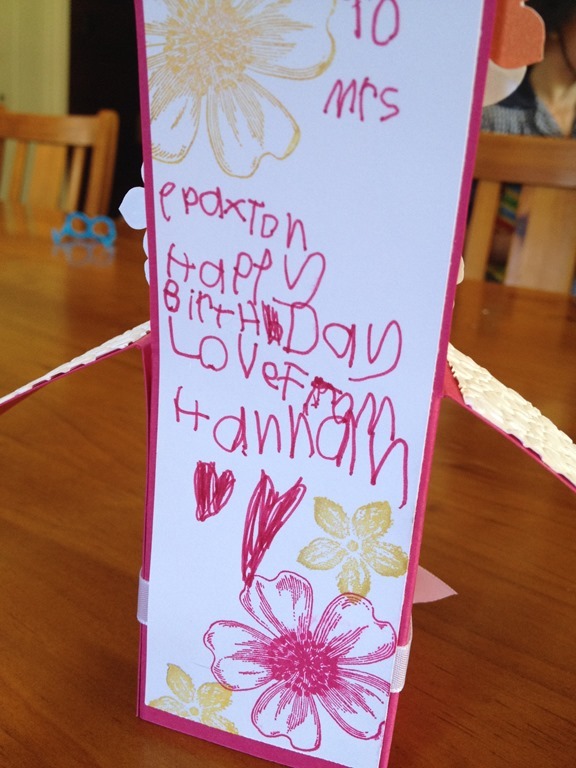 Mrs Paxton’s birthday is the day before hers. Pretty proud of her efforts there. I didn’t even need to tell her how to spell any of the words. If you would like more information about my classes, how to make this card or the supplies used please don’t hesitate to contact me. I will post the the second card from my class in a few days so make sure you check back or subscribe to my blog so you can get notifications when I update. 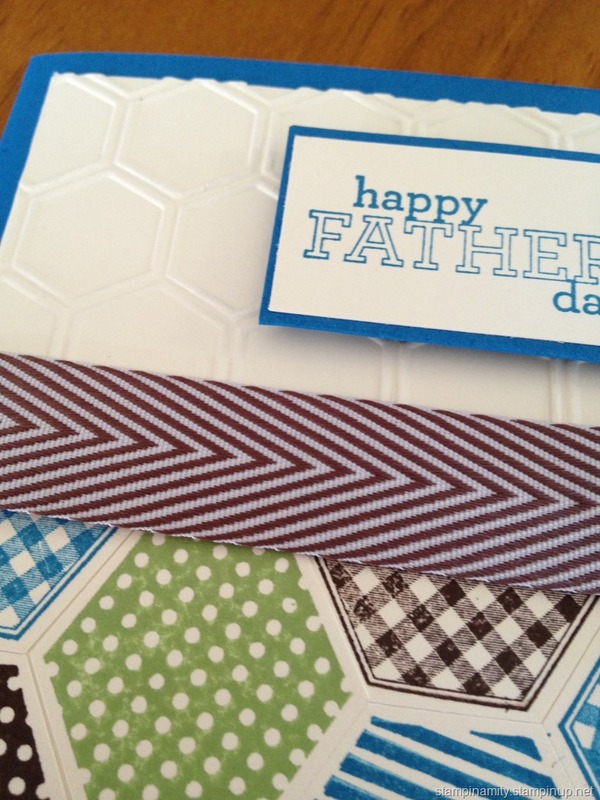 Do you find making masculine cards difficult? 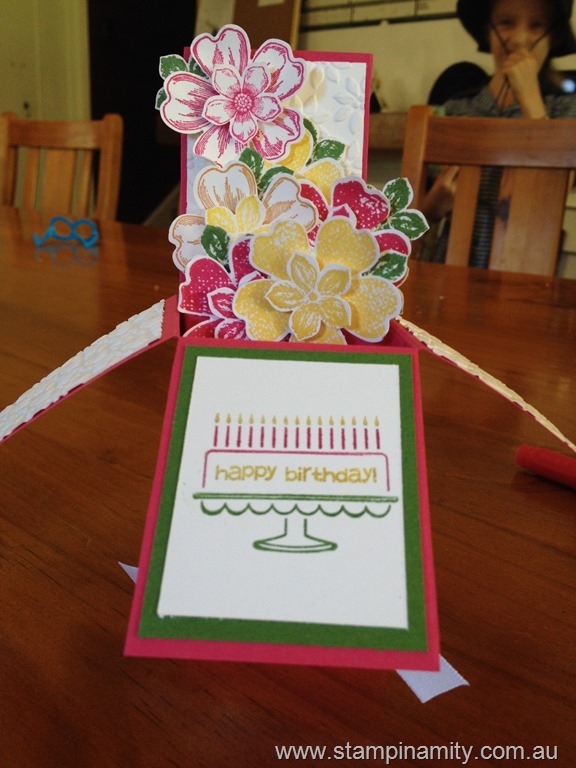 We made two at this month’s card class. What did you miss? 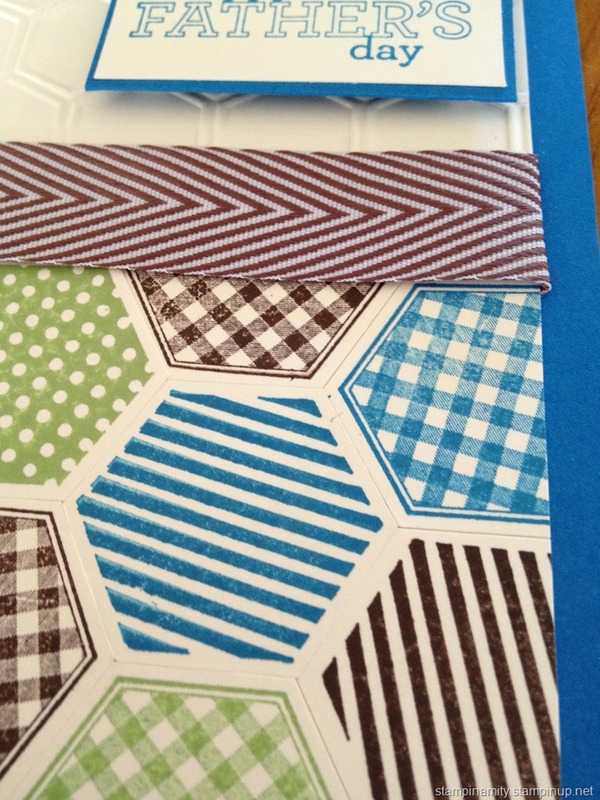 As soon as I saw this hexagon, called six-sided sampler, and matching punch I knew I had to order them. You even get a 15% off discount if you purchase them both. You know by now I’m a sucker for matching stamps and punches or framelits. 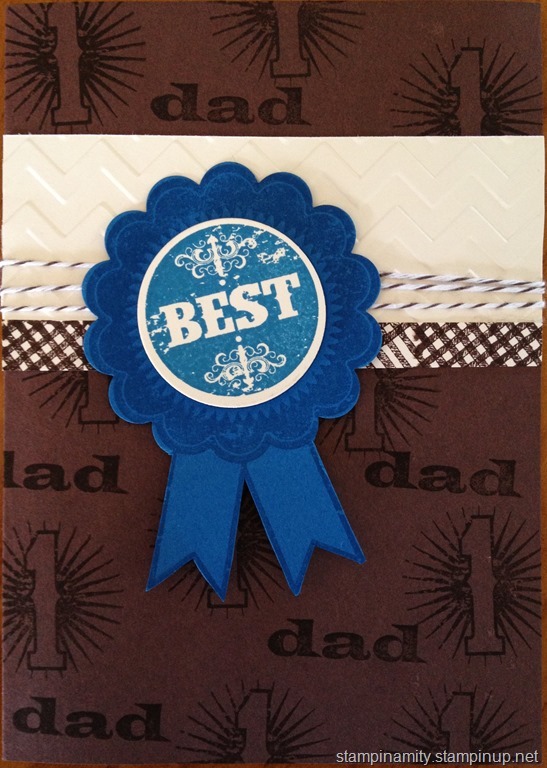 I thought this would be perfect for masculine cards or even baby boy cards depending on the shade you used. Each of these hexagons have been stamped then punched out. 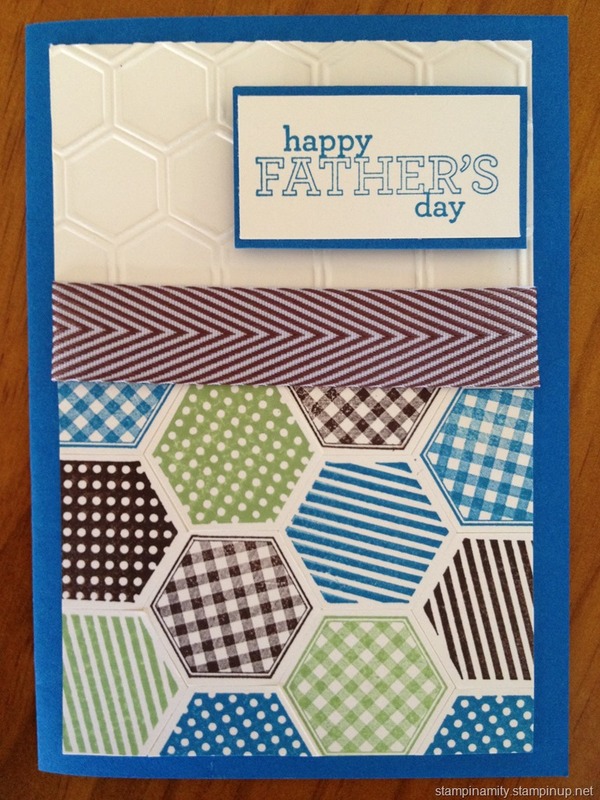 You could also use the Stampa-ma-jig to position the images how you want them but I think it looks really good with the slight gap between the the hexagons where the paper joins. Don’t you just love the chevron ribbon? The second card was a very simple one to create. I’ve been itching to try Blue Ribbon. This is my first creation with this set. Over the year we have worked on creating backgrounds with stamps. I’m fairly certain the regular class attendants are very comfortable with background stamping now. The trick is to make sure it doesn’t look contrived and the best was to ensure a natural looking background is to make sure you start your background by stamping half on half off the page then working down across the page on a diagonal. I will post some pics of this later. These pictures don’t show the Very Vanilla which is embossed with the chevron embossing folder which is another product I love. What don’t I love. Laughing at myself right now. 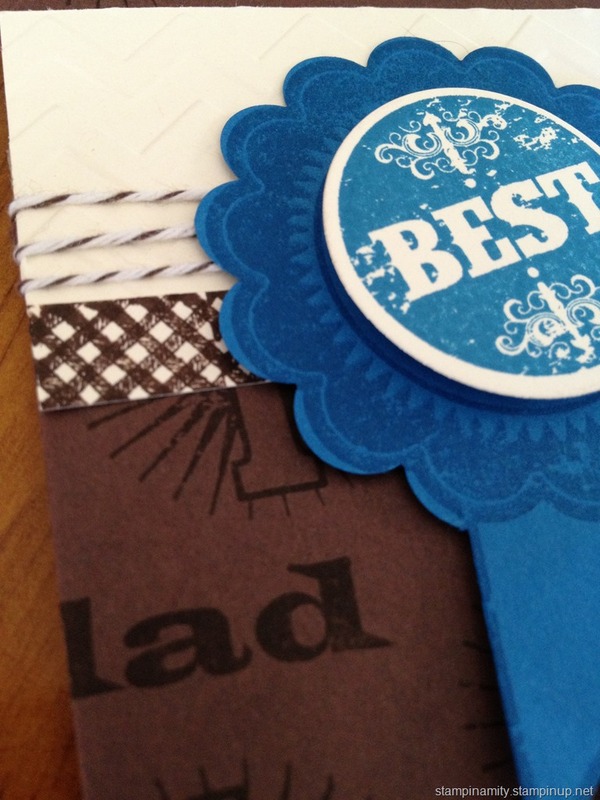 I’m still grinning at the fact that the ink, cardstock, ribbons and twine all co-ordinate. It makes planning so much easier. Next month’s class will be focused on interesting folds. If you would like to book a spot in the class please contact me to reserve your place.